"Original publication date July 2000. Reviewed September 2007 and November 2010." R. O. Myer and W. R. Walker2 Nutrients commonly added to grain for swine rations Protein (amino acids) Vitamins: Calcium Vitamin A Phosphorus Vitamin D Salt Vitamin E Trace minerals: Vitamin K Zinc Riboflavin Iron Niacin Manganese Pantothenic acid Copper Choline Iodine Vitamin B12 Selenium (Biotin) ** (Folic Acid) ** **Sometimes added. 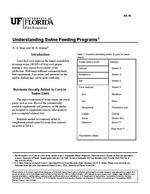 Understanding Swine Feeding Programs 2 Major systems of supplying feed nutrients in swine rations. Ground grain + Protein Source + Calcuim and Phosphorus Sources + Salt + Vitamin Premix + Trace mineral premix Ground grain + Protein Source + Mineral and Vitamin Basemix Ground grain + Complete Supplement Complete Mixed Ration (i.e. 16% swine grower) 1.Vitamin and trace mineral premixes may be purchased as one premix. 2.Optional ingredients, (i.e. medications), may be included in the first three systems above be sure to follow label mixing directions. 3.Basemix may include separately packaged vitamins. 4.Booster packs may be required for some ration types, especially for the basemix and complete supplement systems follow manufacturers' directions. Understanding Swine Feeding Programs 6 Example swine mineral-vitamin basemix. Thiamine Minimum 32 mg per pound Folacin Minimum 20 mg per pound Monocalcium Phosphate, Dicalcium Phosphate, Calcium Carbonate, Cobalt Carbonate, Copper Oxide, Calcium Iodate, Iron Oxide, Magnesium Oxide, Magnesium Sulfate, Potassium Sulfate, Manganese Sulfate, Manganous Oxide, Zinc Oxide, Sodium Selenite, Vitamin A Supplement, Vitamin D3 Supplement, Vitamin E Supplement, Riboflavin, d-Pantothenic Acid, Niacin, Choline Chloride, Vitamin B12 Supplement, Vitamin K Supplement, Mineral Oil, Iron Sulfate, Copper Sulfate, Zinc Sulfate, Thiamine, Folic Acid. Ingredients 16% (grower) 14% (finisher) ----------lbs---------Ground corn (9%) 1,525 1,640 Soybean meal (44%) 415 300 Base mix 60 60 Total 2,000 2,000 Anaylsis: Protein, % 16 14 Calcium, % 0.7 0.7 Phosphorus, % 0.6 0.6 Lysine, % 0.79 0.64 To change from 44% to 49% soybean meal, subtract 12% from soybean meal and add this quantity in corn.